We weren’t too familiar with Periodic Audio before. Yes, we know, perhaps we should be, but there are a lot of audio companies out there and we aren’t omniscient. But after we visited them at this year’s CanJam NYC, and got to hear some of their in-ear headphones, we decided that, perhaps, we should be paying closer attention. The model that impressed us the most was their mid-level Titanium, and in this review, we break down their design, comfort and fit, sound, packaging and accessories, specs and more, as well as how they compare to other models. You can also check out our video review. The Periodic Audio Titanium have, as you might expect, titanium drivers contained in their slim plastic housing. This is part of the company’s whole schtick. The other earbuds they make are the Magnesium and Beryllium – cheaper and more expensive, respectively, than the Titanium – and have drivers made of the material they’re named after. They even make an amp called the Nickel. This is a company that leans hard towards the science, not just in the creation of their products, but also in the marketing of them. Their website is super simple, relying on elements drawn from the periodic table (pun definitely intended) to get the information across. It’s simple and effective – two adjectives which, coincidentally, apply to the Titanium as well. There’s no Bluetooth here. No removable cable. You don’t even get an in-line microphone. Instead, what you get is a pair of earbuds with cylindrical plastic housing. The build is lightweight, yet feels robust enough that you can easily imagine throwing these into a bag without causing too much damage. It’s also a design that is surprisingly subtle; there’s a company logo on the outer housing, which manages to be present without ever really drawing the eye, and there are some pretty cool left and right indicators. That’s not something we’d normally highlight as being particularly cool – after all, when you learn how directions work at age three, it’s kind of hard to be impressed by it – but it’s good to see some thought being put into such a simple thing. The inner grille of one earphone is colored bright red, indicating that it’s meant to be shoved into the right ear. The color is bright enough to be visible even when a silicon tip is shoved over it, meaning there’s never any doubt as to where these things go. And really, that’s about it. They have one of the most simple designs we’ve ever seen, and it works incredibly well. There’s no setup, no fiddling around with removable cables - you take them out of the box and start using them. It’s a pretty commendable strategy for a new company to have, because it lowers the barrier to entry. These are a pair of earbuds that aren’t trying to do anything particularly innovative or creative with their design, just get the job done - and while there are some reviewers that might count that as a negative, we don’t. In this case, we appreciated how direct they were. These remind us of another pair of earbuds that we recently reviewed: the Focal Spark (full review here). They aren’t like for like – the Spark are a lot cheaper, and have a rudimentary set of in-line controls – but the feel and aesthetic is very similar. Those, too, were a pair of earbuds that didn’t try to reinvent the wheel, and they worked well indeed. It’s also worth noting just how tangle free the cable was. We don’t know what science jiggery-pokery Periodic have used to make sure that the 4’11” cable doesn’t catch on itself, but it works. In the time we used these, the bouncy cable never got tied in a knot – something else we appreciated. Compare that to our experiences with the similarly-priced Brainwavz B400 (full review) which, while good, had a major tangle issue. There’s a five year warranty against manufacturing defects, although we can’t see these breaking any time soon. They really do feel solid. This is where the Titanium really surprised us. We’re used to fiddling around with in-ear headphones in order to get a good fit. We’ve long resigned ourselves to accepting it as part of the experience. So, imagine our surprise when the Titaniums, with their stock tips fitted, gave us perfect isolation on the first try. To say this is rare would be and understatement. It has literally never happened before. Not once. And once they were in, they stayed in, creating an excellent seal with minimal effort, which really allowed us to appreciate the sound. A check with Periodic reveals that this isn’t an accident. The ear tips, which are made of medical grade silicone, are custom-designed in-house. These aren’t over-the-counter; real thought has been put into them, and it’s something other manufacturers should take note of. And, if you’re not lucky enough to get it right on the first try, the company includes an embarrassingly large range of tip sizes and types to make sure that you do get the perfect fit. A $200 pair of earbuds better sound good, because the competition out there is fierce. Good thing the Titaniums nailed it. There’s definitely a slight boost to the bass frequencies, but it’s not the kind of overcooked, in-your-face boost that you might get from a product of dubious character, like a pair of Beats By Dre. The word that came to mind as we tested these was: smooth. The bass might have been boosted, but it felt natural, with a warm, rounded quality, and we got a real kick out of. It reminded us of certain tube amps, which have the same slightly gooey quality to their audio. Maybe that’s a little bit too much of a stretch, but it really felt like the engineers at Periodic had spent a good deal of time focusing on the low end, making sure that it performed to their expectations. Because we spend all our time comparing different pieces of audio equipment, a comparison leapt to mind here, as well: the Campfire Audio Orion. These earbuds – which are slightly more expensive – have the same smooth character to the low end. Hearing that quality in a pair of buds that cost a little under $200 is very impressive. Ditto for the soundstage. While not as wide or as deep as the qualities demonstrated in something like the MEE Audio Pinnacle P1 (full review here), it still manages to impress, with good detail and positioning of the individual sounds. If we had one criticism of the audio quality, it’s that the high end could use a little work. It’s not a big issue, just an unfinished quality - a slight fuzzing of the details in the upper frequencies that might turn you off if you listen to music with a ton of dynamic range, like orchestral, or movie soundtracks. We found that vocals and violins, for example, didn’t have the sharpness and detail that we would have liked to hear. But again, we didn’t consider this a major problem, especially not when juxtaposed with that gooey, gorgeous bass. And we have to give Periodic credit: they even admit this on their product page. “[The Titanium] tends to be preferred by those who listen to electronica, dance, and bass-heavy music. Not our most objectively accurate IEM, it is a lot of fun to listen to.” Word. And if you do want something with more accuracy in the top end, and with a touch more balance, we’d suggest going for one of their more expensive options, the Beryllium. Very obviously, we didn’t test call quality with these, as there’s no in-line microphone. Periodic Audio package the Titanium in a box containing marketing copy that is more – how shall we put this - comprehensive than just about any other product we’ve ever seen. The specs list not only tells you the impedance of the Titanium (32 ohms) and the sensitivity (96dB). It also tells you their melting point (1,941 Kelvin, and no, we didn’t test this), the speed of sound (because, why not? ), the Young’s Modulus, and the Brinell Hardness (whatever in the hell those are). If you know what it all means, please reach out and tell us. Yes, we could Google it, but this is more fun. The coolest accessory here is the tin the headphones come in: a gold number with a screw-top lid, embossed with the company logo. Even if you don’t use it to store the headphones, you’ll want to keep it around. And outside of the previously mentioned selection of tips, you get a 6.3 mm adapter, as well as an airplane adapter. That’s a surprisingly comprehensive range of doodads, and they get a big thumbs up from us. They really nailed it on the Brinell Hardness scale. We know exactly who these earbuds are for. If you meet any of the following criteria, you should buy them. They’re for people who have grown tired of their included phone earbuds. They’re for people who enjoy music, and want to present it in a much better light than they currently do. They’re for people who want to explore what’s just over the audio horizon, but aren’t interested in bells and whistles like Bluetooth. And they’re for people who want a solid pair of affordable earbuds, that will get the job done, and provide years of satisfaction. It’s rare that we can look at an audio product and know exactly who will benefit the most from it, but it’s definitely the case here. It’s true that we could’ve taken marks off for things like the lack of an in-line control - we very nearly did. But on balance, we decided not to. It didn’t make sense to us. These were not a pair of earbuds that were crying out for the ability to answer calls on the go. The design has stripped everything down to its core, focused with laser precision on delivering a single experience. Adding extra bits would have ruined that. These aren’t the best earbuds available at this price range, but they are very, very good. We had an absolute blast using them, and expect big things of Periodic Audio in the future. And by big, we mean opening a rip in the space-time continuum and transporting the mainland US to the Horsehead Nebula. After all, why not be ambitious? High-end needs a touch more detail - although other models provide for this. These are a bit old now – MEE audio have moved on with models like the Pinnacle P2 – but we still prefer the originals. 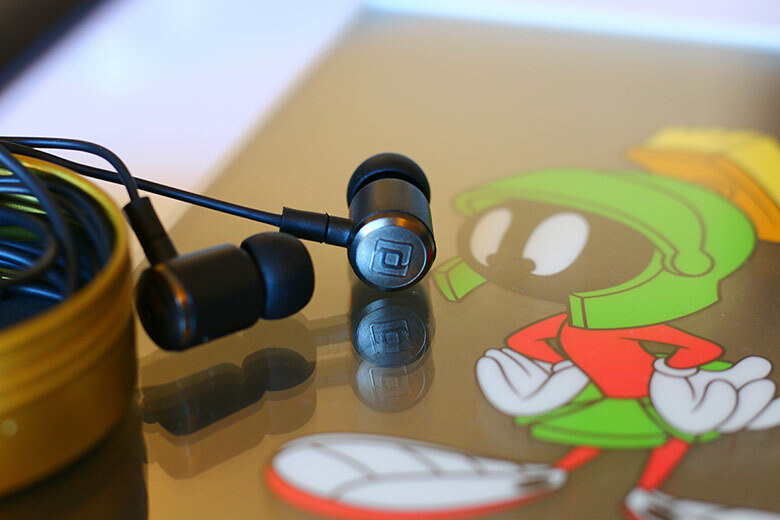 Not only do they come with the grooviest carry case in the earbud world, but they also sound fantastic. The metal buds deliver a sound that is quite a bit more neutral and precise than the Titaniums, and, as such, can be seen as an alternative for those who don’t like their bass to be too powerful. We gave these buds a big thumbs up when we reviewed them, and they come highly recommended. Read our in-depth review. If you don’t have a lot to spend, but still want a pair of earbuds that will deliver decent sound, look no further than these little French numbers. Focal really stack the deck here, with an in-line microphone, solid (if slightly plasticky) construction, and surprisingly refined sound. In the sub-$100 range, these work exceedingly well. Read our in-depth review. You know how we said the Titaniums were earbuds without any bells and whistles? This is where you come if you want bells and whistles. For an almost identical price, you get a pair of very well-made buds, with a removable cable and in-line microphone, as well as scintillating sound quality. We’d be hard-pressed to say whether or not they beat the Titanium, but they’re a more-than-worthy alternative. Read our in-depth review.